As the end of the year approaches, our family and partners in ministry are grateful for all that God has done in and through us this past year. 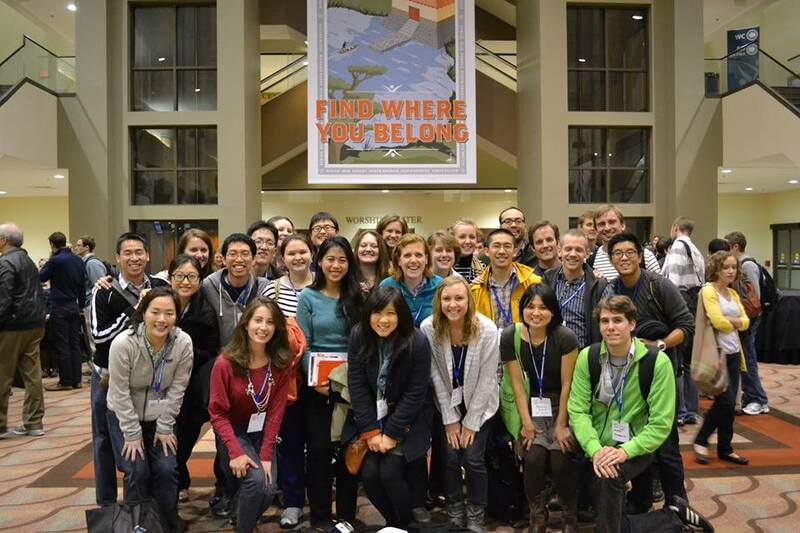 We’re already looking forward to another great year, beginning with the students’ return in early January and our CMDA Northeast Winter Conference, where students and professionals from the region will gather together for a weekend of encouragement and refreshment over Martin Luther King, Jr. weekend. For now, though, I want to encourage you that your prayers and gifts are making a tremendous difference. As you know, throughout the semester we have been hosting 20-25 students from the area for an in-home bible study breakfast and study of Jesus, MD, a book by our CEO Dr. David Stevens. At the end of that book, Dr. Stevens shares about how God worked in nearly-miraculous ways to provide a hydroelectric dam for the mission hospital (Tenwek) where Dr. Stevens served some time ago. For many years, the dam had seemed like a pipe dream, entirely out of reach because of the exorbitant expense. And yet, God “showed up” in unbelievable ways so that this need was finally met, allowing critical medical equipment to operate throughout the night, thus literally saving many lives. In our study, this hydroelectric dam has become a tangible symbol for what the ‘impossible’ things God wants to do in and through the members of our group. At the end of our final meeting for the semester, Sharon and I were humbled as the students presented us with a card of appreciation. But it wasn’t just any card. 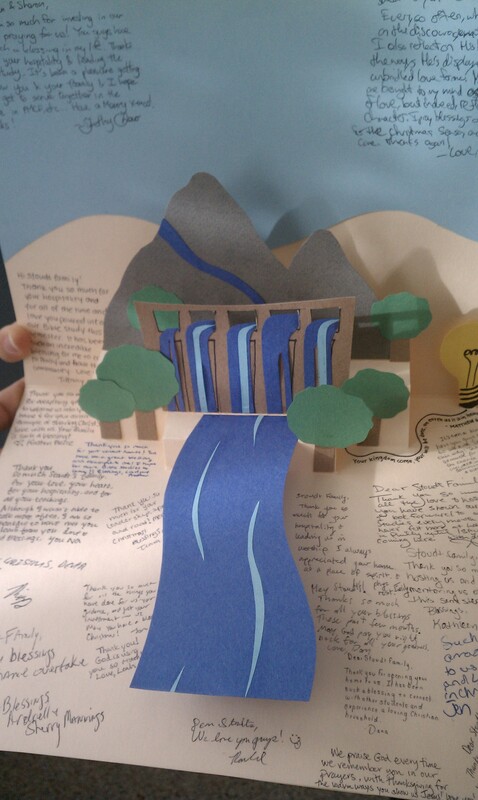 It was a pop-up card, made by one of the students, featuring a representation of the hydroelectric dam from Jesus, MD (pictured above)! The gratifying part was not so much that we were thanked, but that the students are “getting” how great God is and what He wants to do in and through them. This is why we’re in ministry! We can’t wait to see what “hydroelectric dams” God may have in store for us in the coming year. Be encouraged that God is at work, and join us in praying that He will meet and exceed our expectations, as He always does (Ephesians 3:20). Many of you will recognize that line from a familiar Christmas song (yes, it’s a little pollyanna), but I feel that way every August and September when our students come back to campus. This is the time when we meet the first-year students we’ve been praying for, and, renew friendships with those who are returning. This is the season for intense planning and strategizing, a time I meet with campus leaders and figure out what initiatives we need to take. And this is the time where I’m looking for up-and-coming leaders, people who will change the face of Kingdom medicine for the next generation. Now do you see why I love it?! Let me give you a few quick snapshots of this “most wonderful time” as we’ve experienced it over the past month. I love working with our campus leaders. It’s a huge challenge because, every single year, the turnover is 100%. Our leaders have only been on campus for one year when they ‘take over’, and, half of that year has been spent adjusting to the rigors of med school life. Furthermore, the student leaders are juggling leadership with an academic load that some estimate is five times as intense as college. As you know, though, huge challenges bring huge opportunities. Since I’m here for the long haul and involved with various campuses, I bring a unique perspective to the table. I sit down with the leaders and/or graduate faculty volunteers and help them figure out how we’re going to reach their particular campus with the particular people and hurdles God has placed before them. At Jefferson, for example, I had the privilege of being invited by (faculty advisers) Dr. Loren Chen and his wife Anne to take part in a mini leaders’ retreat they hosted at their home. Sharon and I were able to offer suggestions on developing an agenda for the weekend, and I joined them for lunch and part of their planning session. It was wonderful to watch Loren and Anne do such a phenomenal job, and, to start developing relationships with the leaders. Our involvement with the Jefferson retreat illustrates a subtle, but real, change in our ministry God has been directing for some time now. Although we still do a lot of ‘hands-on’ work with students, more and more we feel called to help others shine where they are. 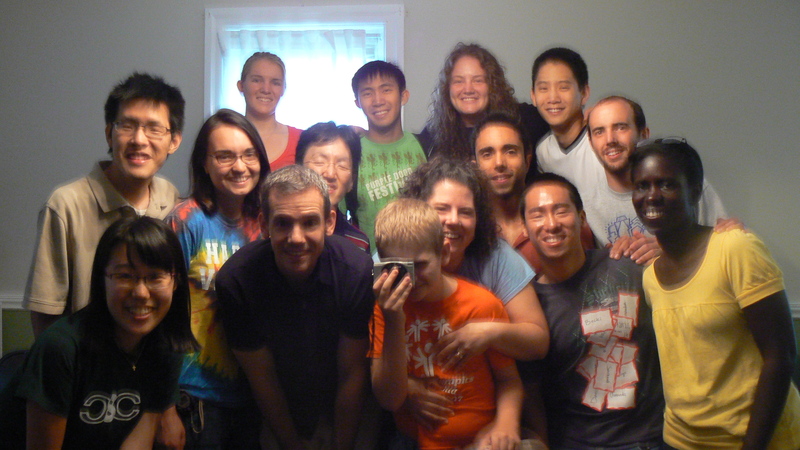 Without a doubt, there is so much potential medical ministry in Philadelphia that it will take an army to accomplish! Last year, for instance, I met Jasen, then a first-year student at “SOM”, a medical school just across the river in South Jersey. I asked him to get together in an effort to both understand his fellowship’s needs and how we could help. It became clear that there was a need for graduate advisers, but also that I could not serve that role consistently due to my other ministry responsibilities. That’s where Dr. Jerry Hric has stepped up. Jerry is one of our newer council members, and ‘just happens’ to live 10 minutes from SOM’s campus. He and his wife also have a huge heart for students, and they have started hosting students – Christians and others – at their home regularly. At a planning meeting last evening, 12 students – now leaders – showed up at Jerry’s home and decided to meet weekly on campus for sharing and fellowship, as well as getting together weekly for bible study in Philippians. They aim to involve all 60 students signed up for the fellowship and spend nearly half their energy on outreach. Just last year, SOM’s fellowship was really struggling. Isn’t God wonderful?! Our heart is to walk alongside people like Loren, Anne and Jerry to bless and encourage them in the ministries God is giving them. In this way, the Kingdom spreads in ways that we could never dream of accomplishing on our own. As I mentioned above, Sharon and I are still involved with students directly. We’re especially excited about our home bible studies, which started a week ago. They’ve been well-attended in the past, but during the summer we decided it was time to more intentionally equip those who come to reach those around them. To do that, we’ve asked them for a greater commitment – to come consistently, be vulnerable with each other, meet every 3 weeks (instead of 4), and, do some ‘homework’ in-between meetings. With that in mind – as well as a 9am start time – we expected a smaller turnout. What happened, though, was just the opposite! Twenty-four students from all over the city attended, not to mention several who wanted to come but couldn’t! Needless to say, we’re looking forward to our next meeting later this month! We hope that gives you a nice snapshot of what God has been doing. THANK YOU for playing such an important role through your prayers and giving. We could never, ever do it without you! Praise for a huge turnout for our first home bible study breakfast! Please pray that God draws many back next time (Sept. 17th, 9am), and that those who come develop an all-out passion for reaching the people around them for Christ. Praise also for the opportunity to meet the new students as I visit our various campuses, and, to invest in many of our leaders. Please pray for wisdom to develop further relationships with the leaders and to speak into their situations in a way that furthers their ministry. Pray along the same lines for our relationships with the graduate advisers. Please pray, too, for the many meetings I’m having with key men from around the city. Please ask God to help me help them become difference-makers for the Kingdom. Pray for several students who are “seekers” at one of our campuses, especially that believing students in their lives would continue to represent Christ faithfully to them. One of the ‘secrets’ to Paul’s ministry was his strategic investment in younger men who became pastors at the churches he planted. By pouring his life into other godly men, Paul reached the known world in his day, even claiming that the gospel “has been proclaimed to every creature under heaven” (Col. 1:23). What a vision for ministry! During this last year, God has given me the opportunity to make a similar investment in our intern, Brian Pugh. At the beginning of his internship, Brian had just graduated from seminary, and was eager to test his gifts and gain practical ministry experience. His wife’s commitment to a career in medicine made serving medical students with MCO an especially appropriate match. Brian did an outstanding job throughout his internship. He led bible studies, preached the Word, mentored younger men, and provided guidance for one of our campus fellowships, the Philadelphia College of Osteopathic Medicine (PCOM). I was especially excited to see him discipling several younger men in the fellowship, and noticed the difference in their lives as a result. He also expertly-administrated our annual Winter Conference – no small undertaking considering 250 were in attendance! that he is good at administration and delegation. These were invaluable lessons that have prepared him for the next step, and I feel privileged to have been part of his journey this year. My prayer has been that the Lord would take His investment in me and share that with Brian. By God’s grace, I believe that God has answered that prayer. As for the “next step”, Brian will be heading down to Nashville, Tennessee to work with InterVarsity’s Graduate Fellowship. He anticipates splitting his time between graduate and medical students there over the next three-four years. Undoubtedly, the Lord will use him to reach other students who will then, in turn, reach others. In this way, the small investment I made in Brian this year will lead to significant fruit for many years to come. This is what ministry is all about! Thank you for your own investment in me, and our family, through your prayers and gifts. Through men like Brian, your faith and love are reaping great rewards. Praise God for His good work in and through Brian and his internship. Praise God also for bringing us together for this past year. Pray for Brian as he transitions to Nashville in late May and begins raising support for his ministry with InterVarsity. Pray for us as we enter the ‘home stretch’ with MCO. Pray that we would finish well and do all we can to prepare it for this next season after our departure. Continue to pray for us as we seek God’s leading for a new ministry position. We have a strong option, but want to make sure it is His will for us! Please pray for our son Matthew, as he has been exhibiting both destructive and (some) obsessive-compulsive behaviors at home and school. Pray also that we love him, and show him Christ’s patience.